So that was it for Doctor Who, I thought. A shame in many ways but probably for the best, I thought. 1991. The first sign of the Doctor's return occurred in the basement of Forbidden Planet (in its larger home in New Oxford Street). A confirmed geek, I'd been continuously visiting the store in its various locations since foundation. In those pre-internet days it was often the only way to get news about what was going on in my favourite fictional worlds without crossing the line into the scary territory of fanzines or hanging out at the Fitzroy Tavern, something which, for some reason, I was unwilling to do. That had obviously been my undoing. This rebirth as a series of books entitled The New Adventures of Doctor Who published by Virgin was apparently masterminded by a cabal of uberfans. Flicking through these new novels they seemed to be self-consciously more adult than the former TV series and its Target novelisations, with chapter titles taken from Stone Roses songs and numerous modern cultural references. This annoyed me for some reason. It was almost certainly sour grapes because at the time I was working on my first not-quite-published novel and as a budding writer I would have given up several teeth to have a crack at writing for Doctor Who. I'd probably have extracted them myself. Instead, these uberfans had taken over and seemed very smug about it. I didn't know who Mark Gatiss, Russell T Davis or Paul Cornell thought they were, but as far as I was concerned they were just writing silly little spin off novels, not the actual TV series. They weren't canon. No doubt I'd have had a different opinion had I been writing for the range (and I did start drafting a novel at one point) , but as it was I decided I had no interest in following the imaginary fanfic adventures of this Cartmel Masterplan Seventh Doctor and entered a Doctor Who related sulk for several years. I softened a bit when Virgin started publishing Missing Adventures featuring past Doctors, some of which I bought and read, but it took the genuine return of the Doctor to TV where he belonged to really snap me out of it. It was 1996, seven long years since the series had gone off air. I don't remember hearing about it that much in advance, despite the fact that by then I had access to the newly founded wild west web and that Outpost Gallifrey had gone online for the first time the previous December. 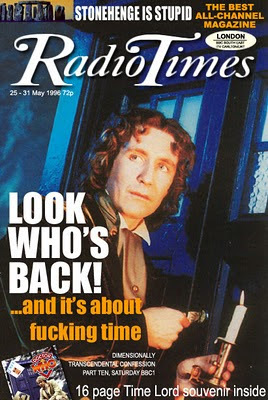 Apparently it was starring Paul McGann, which felt like good casting to me. I was now living in a shared house in Walthamstow and had already started boring my flatmates with the UK Gold repeats on cable, so was confident that I'd be able to watch on broadcast without interruption or having the piss taken out of me. There was a lot I liked about it and a lot I didn't. I thought McGann was perfectly cast and his costume felt very Doctor-ish without being a copy of anything that had been before - certainly far better than McCoy's seedy pervert outfit, Baker 2's clown costume or Davison's sports kit. I liked the way the series carried on from where we'd left off with an older, wiser and far less irritating Seventh Doctor at the controls of the TARDIS. Listen matey, it may sound like an off the cuff flippant remark to you, but believe me this is going to have fandom up in arms for the next fifteen years! The "I'm half human" remark didn't bother me (I just thought he was joking) neither did the Eye of Harmony being in the TARDIS. To this day people shriek about how these things prove that the McGann movie isn't canon, but as far as I was concerned if it was on screen, it happened. This was a show after all with more than one explanation for both Atlantis and the Loch Ness Monster. Deal with it. So you're not Human, right? Nope. Well, I was, back in 1999 for a couple of days, that was like catching a 48-hour bug, I got over it. However, I'm glad the series didn't go any further in 1996. 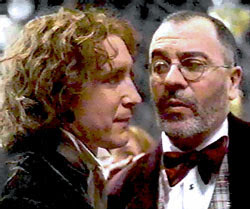 Whilst it was interesting to see the Doctor in a new body fighting the Master in San Francisco as a one off, I'm not sure I could have coped with the plans they had for the show; apparently the Series Bible contained all sorts of annoying nonsense including stuff about the Doctor's father. So, despite healthy ratings in the UK, the fact that the US audiences were more interested in what Roseanne was up to that week saved us from this grisly fate. It meant that my obsession was back to square one, though. The BBC took over publication of the series of novels; I read a couple by by this point I felt I'd missed too much and wouldn't know what was going on. To this day my eyes start to glaze over when fans start talking enthusiastically about Compassion, Fitz, Chris Cwej, Faction Paradox and Bernice bloody Summerfield. Without the return of the TV series I couldn't see how I could ever return to the state of enjoying the ongoing adventures of the Doctor. Then, in the opening years of the twenty-first century I was exploring the audiobooks section of Borders in Brighton (to where I'd returned to live ) and spotted a double cassette bearing the Doctor Who logo. Closer inspection revealed it was not simply an audio book, but an original full-cast recording featuring the Fifth Doctor and Nyssa. I explain what N = R* x fp x ne x fl x fi x fc x L means for you and me.